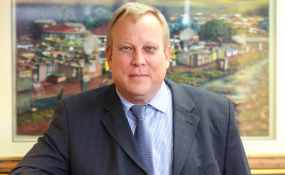 Corruption charges have been filed against acting SA Revenue Service (SARS) commissioner Mark Kingon by an unknown and obscure organisation named the Anti-Poverty Forum (APF). The charge was laid by APF's director Phapano Phasha on Tuesday at the Brooklyn police station. News24 is in possession of documents relating to the case and a case number. National police spokesperson Brigadier Vish Naidoo confirmed that a case of corruption had been opened against a government employee, but would not reveal the employee's identity. The docket has now been handed over to the Hawks for further investigation. According to the documents, Phasha claims Kingon is guilty of gratification for allegedly agreeing that a settlement be paid in the Vlok Symington matter. Symington made headlines in October 2016 when a video emerged of him allegedly being held hostage in a SARS boardroom by a member of the Hawks, Brigadier Nyameka Xaba, and Thabo Titi, a bodyguard to former SARS commissioner Tom Moyane. In August, City Press reported that SARS had ignored legal advice that its agreement to settle Symington's legal bill was questionable. The pair tried to wrest a damning email away from Symington, ostensibly accidentally shared with him by Moyane - Symington recorded the altercation, and the video was handed to the Independent Police Investigative Directorate (IPID). SARS then instituted disciplinary charges against Symington and Titi - both employees of SARS - which sparked Symington's court bid. Symington approached court to prevent what he claimed to be an unfair dismissal. According to documents seen by City Press, Symington was expected to pay SARS at least R300 000 for its legal bills in the matter. The questionable settlement, which SARS ended up agreeing to, involved the revenue service paying both Symington's and its own lawyers. At least R750 000 was tabled as half of Symington's costs for the two-part case, which meant that the entire agreement would have cost taxpayers more than R1m, if SARS' costs were factored in, City Press reported. Kingon and his colleague, employee relations executive Luther Lebelo, reportedly took responsibility for the controversial decision. However, other SARS executives were reportedly opposed to the agreement and later distanced themselves, City Press said. Kingon had been on the record, saying he and Symington were friends, which led to some questioning about whether there was a conflict of interest. SARS spokesperson Sandile Memela denied Kingon's involvement. He told the publication that Kingon and Symington were senior colleagues at SARS for more than 20 years "and hence have a collegial relationship". Phasha alleges Kingon is guilty of violating the Prevention and Combating of Corrupt Activities Act (Precca) in that he "gave" Symington "a gratification for the sum of over R800 000 for the benefit of Symington". Previously, Phasha was the spokesperson for the Progressive Professionals Forum and appeared on the former Gupta-owned news station ANN7 as a political analyst several times. Although little is known about AFP, the forum called on the commission of inquiry into state capture in November to remove evidence leader, advocate Paul Pretorius, and senior counsel, advocate Vincent Maleka, claiming that there was a conflict of interest "be it direct or perceived". "Adv Pretorius SC represented Mr Adrian Lackay at the CCMA in a matter between Lackay v SARS on pro bono for well over 200 hours. "It is common cause that both Minister Pravin Gordhan and Adrian Lackay have a long-term personal and professional relationship spanning for over 15 years, which has developed into a father-son relationship," the forum said at the time. Read this report on News24Wire.com. Copyright © 2018 News24Wire. All rights reserved. Distributed by AllAfrica Global Media (allAfrica.com). To contact the copyright holder directly for corrections — or for permission to republish or make other authorized use of this material, click here.